Don’t forget to stop over at our facebook page and check out the posts that go on there as well! Each day I try to locate a quote on which I meditate and think about during the day. This morning I happened across this quote from Soke Tanemura and though long and hard about this, and I especially delved into the piece about Ninpo is the art of harmony. Let me know what you think about on this short bit of ninpo philosophy. Ok, now after gleaning through the report, I also gathered this tidbit, all of the most dangerous cities have the highest unemployment levels(all above 10%) and low percentage of High School diplomas(below 86%). After gathering this information, I reviewed the local surrounding town and city data around my home location and found that all of this data is available(for free) especially on various real estate, and Town/City webpages. Now what does this all mean to you as a lesson? Well, if you want to be aware of your surroundings you need to be informed about your surroundings. Utilizing the internet to gather information on a particular subject is pretty easy today, but then the analysis and further exploration to glean out the information required for your purposes can be somewhat difficult if you don’t understand how to analyze and lean down the information to something useful. Your lesson today is to find the same type of information on the local surrounding towns and cities in your area, so you know where the higher crime areas are, what type of crimes are most prevalent, so that you can avoid or be prepared to prevent them. Hey, during the 15 min search for the information in my area, I came upon an a brief report of a rash of car break ins in my town! You never know where the information may lead you. Well before the advent of a GPS device or even a very good compass, the ninja of ancient Japan navigated across the countryside, day or night, all with low tech skills. Shocking!!! Well of course there have been great technological developments that allow us to start and end a few feet from where we plan, but what if you had to navigate without a GPS or good compass, could you do it?? Over the years, I have learned from Scouting, primitive survival training and practice, several methods to navigate without a compass but here is one of the easiest and most practical to learn and implement in your training. 3) Take the point halfway between the hour hand and 12. This position indicates South. 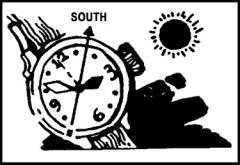 Ex) It is 6:00, point the hour hand at the sun, and the halfway point would be 3:00 which would be south. 3) Take the point halfway between the 12:00 and the hour hand. This position indicates North. Ex) It is 6:00, point the 12:00 position at the sun, and the halfway point would be 3:00 which would be north. Now, I have taught this to my students, Scouts etc. and they are all pretty amazed at how easy it is and surprisingly accurate as well. So find a place you can’t get easily lost in and practice this skill! For those of you who where a digital watch….it is time to buy a new watch!! Ok a lot to cover quickly, first: thank you for all of the emails and links to see why I haven’t been posting lately…well 2 fold. Work has been keeping me swamped with a contract from SOCOM, starting up as well as producing a lot of other items for various LEO and military units I actually was buried! ( Lets just say I work in the ballistics field and run a plant that produces a lot of units) secondly I am gathering a ton of information for posts and new Online Training material. This upcoming launch will also coincide with our first Training Group program later this month. Alright, Independence day is a great time to reflect back on the freedoms we have here in our great country, but as we all know it didn’t come or will remain free unless we keep it that way. So one of the best methods to stay free and enjoy it is to become informed and learn about things you will need to know in the future. As a ninjutsu practitioner you should already be familiar with the martial arts, but what about improvised weapons? Escaping tactics, Disguise, Information gathering and protection of that information, Land navigation, primitive survival skills and so on and so on. Well stay tuned here and spread the word my friends because here comes some great material!! Time to go make things go BOOM!